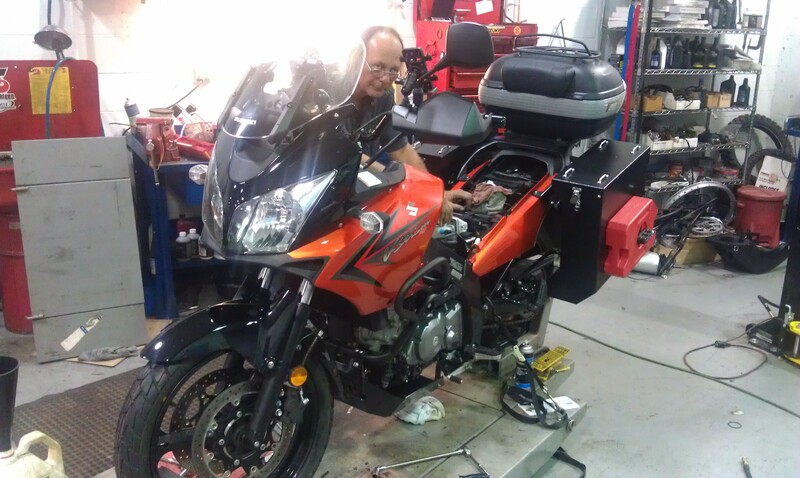 Final Service on the V-Strom! Just 14 days until Rally Around the World begins – can hardly believe the launch date is so near!! Cool Springs Powersports in Franklin performed the final service on the bike to include tires, fluids and a final inspection of all systems. Ray is a huge source of cycle knowlege with over 30 years of experience servcing & repairing Japanese bikes. He’s an avid rider and was even the top dirt-track rider in Illinois. I asked him if there was any one thing I should take on my trip, he reached for the PJ1 Black Label chain lube – a daily must at the end of a long day! Tire pressure is also critical and he even recommended running 36 pounds in the front tire instead of 33 on the V-Strom…will continue to keep the rear tire at 41 pounds. He went over all the tricks to removing the fuel tank, replacing spark plugs, air cleaner and sevicing all the fluids while on the road…one great tip was placing a wrench between the chain and rear sprocket and rolling wheel forward to seat the axle tightly against the adjustment stops before final torquing assuring proper alignment. Thanks you Cool Springs Powersports and Chris Holbrook for arranging the final service and expecially all the folks in the service department: Roland, Kate and Ray! This entry was posted in Corporate Sponsors, Motorcycle & Equipment, Rally Around the World and tagged Cool Springs Powersports, Suzuki V-Strom DL650 by rallyaroundtheworld. Bookmark the permalink.